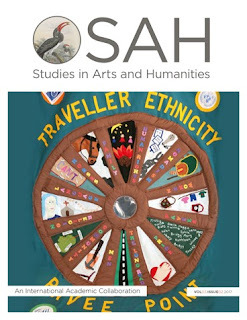 The Editorial Board of Studies in Arts and Humanities Journal agreed to mark the official recognition of the ethnicity of Irish Travellers by the Irish Government in 2017 by publishing a special issue on minorities and indigenous people. I am grateful to the Editorial Board for allowing me the opportunity to edit this issue. The librarian– faculty publishing partnership creates meaningful networks across disciplines, institutions and countries. Studies in Arts and Humanities Journal is an open access, peer-reviewed academic journal which publishes quality academic papers by undergraduate and postgraduate students alongside that of faculty. It also publishes work by artists and practitioners. The Special Issue on Minorities and Indigenous People attracted submissions from academic institutions from around the world, including Monash University, the University of Auckland, the University of Hawaii at Mãnoa, Cambridge University, Dublin Business School, Trinity College Dublin, University College Dublin and the University of St. Andrews. Martin Collins, the Co-Director of Pavee Point Traveller and Roma Centre, wrote a powerful editorial in which he contextualised the importance of the official recognition to Irish Travellers. We grouped together other submissions on the Irish Travellers in an In Focus section. Missie Collins provided insights into the creation of the Traveller Ethnicity Quilt, Traveller lifestyle and the many years of campaigning that have finally wrought this recognition. Professor Gianpiero Cavalleri provided an overview of the recent DNA study of Irish Travellers which demonstrated that the Travellers did not split from the settled community during the Famine, as had previously been believed, but rather some twelve generations ago. Anthony Howarth, a PhD student at Cambridge University, looked at the recognition of Traveller ethnicity through Barth’s critical approach to the study of ethnicity. There is an almost global sweep to the content in the issue. Articles look at the experiences of the Roma, the Māori, the Aborigines, Kanaka ʻŌiwi in Hawaii and the Sephardic Jews who were exiled from Spain, through a variety of prisms including civic emancipation, resource ownership, resistance, genealogical curation and cultural syncretism. We are particularly pleased to have published our first piece of European funded research, The Commencement of Roma Civic Emancipation by Professors Elena Marushiakova and Veselin Popov. Mo Wells, a member of the Lakota Sioux, contributed an insightful perspective on the Standing Rock protests against the Dakota Access Pipeline. Also included is a topical article on the protection of endangered languages. In the course of editing this issue, it struck me that open access publishing offers an incredibly powerful platform for the voices of minorities and indigenous people that are so often excluded from discourses that concern them. We hope that in the year of the official recognition of the ethnicity of Irish Travellers that this special issue helps to empower the voices of ethnic minorities through its peer reviewed academic content.